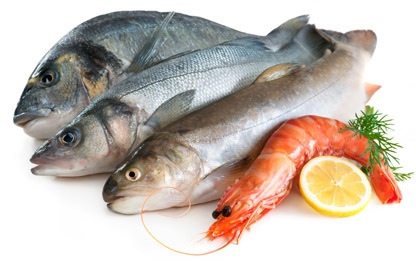 Seafood supplies your body with heart-healthy omega-3 fats, vitamin D and protein. If you are new to preparing seafood or need fresh ideas, give these a try. Preparation tip: The minimum internal temperature for fish and shellfish is 145°. Translucent when raw and opaque when cooked, salmon should flake apart easily with a fork when done. Flavor pairings: Rosemary, thyme and root vegetables pair well with salmon. Bold Asian flavors such as teriyaki, sesame and ginger also complement grilled salmon. Preparation tip: Scallops cook quickly and become chewy and tough if overcooked. To get a crisp crust, pat scallops dry before searing over medium-high heat. Flavor pairings: Enhance the subtle sweetness of scallops by pairing with lemon or lime zest, orange juice, coconut oil and soy sauce. Preparation tip: Peel and devein shrimp by grasping the head and pulling the shell and legs away from the body. Flavor pairings: Marinate in citrus, chiles and other fresh flavors to create ceviche, a popular dish from Peru. Or add Thai flavors like garlic, honey lime and fresh ginger.